The biggest drama of the Pittsburgh Steelers‘ offseason has yet to take place, but perhaps it is getting ready to. The Steelers are very interested in re-signing outside linebacker Jason Worilds who is a free agent starting on March 11.The man standing in the way, LaMarr Woodley. Four years ago, Woodley was loved by the entire Steelers Nation for his cockiness and hard, physical play, but with three straight seasons where he missed significant amounts of time, it seems the Steelers may be ready to move on. According to the Pittsburgh Post-Gazette, it is starting to look like Woodley will not be with the team in 2014. If the Steelers were to release Woodley at the start of free agency, his cap number would be roughly $14 million, but on June 1, becomes $5.6 million according to OverTheCap.com. 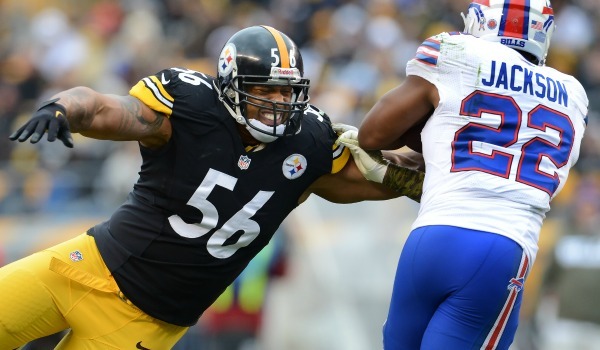 It looks like the team will sit down with Woodley and if he is unwilling to take a pay cut, the Steelers will show the 30-year-old outside linebacker the way out. The Steelers are hoping to see production from Jarvis Jones so he can become a main starter on the defense, along with Worilds, if the team can retain him. Not only will linebackers coach Keith Butler have his hands on Jones in his second season, but so will Joey Porter, who was hired as a defensive special assistant last Tuesday.